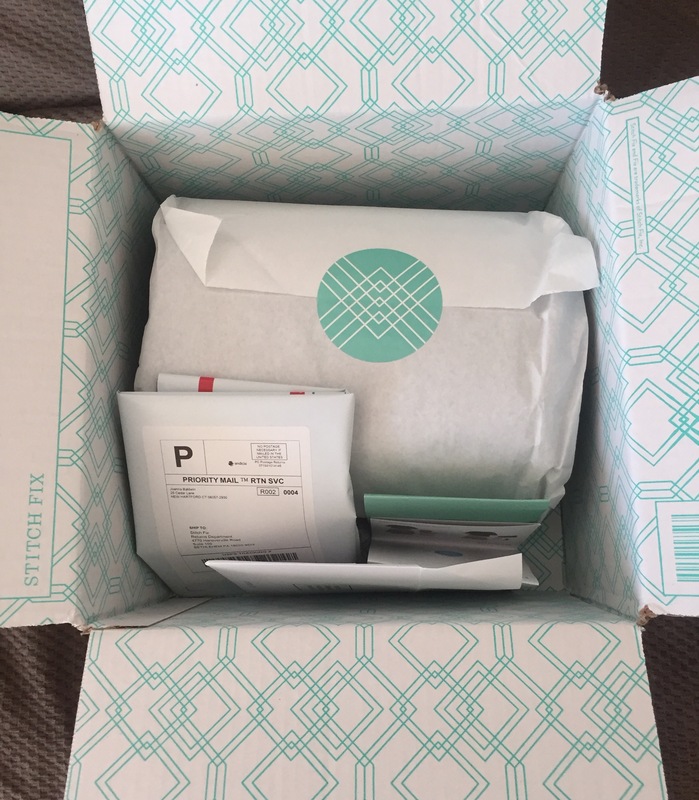 My first stitch fix box arrived Thursday – a day early! – and I couldn’t have been more excited! At first glance, the color scheme seemed perfect for me and I was happy to see a pair of jeans in the mix. 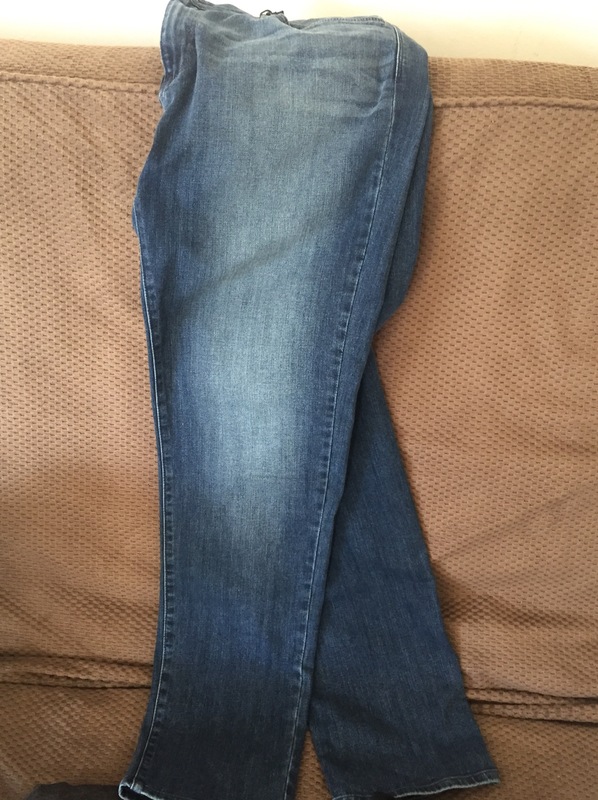 I decided to start with the jeans since they were most likely to disappoint. And they did. I couldn’t get them up past my hips. 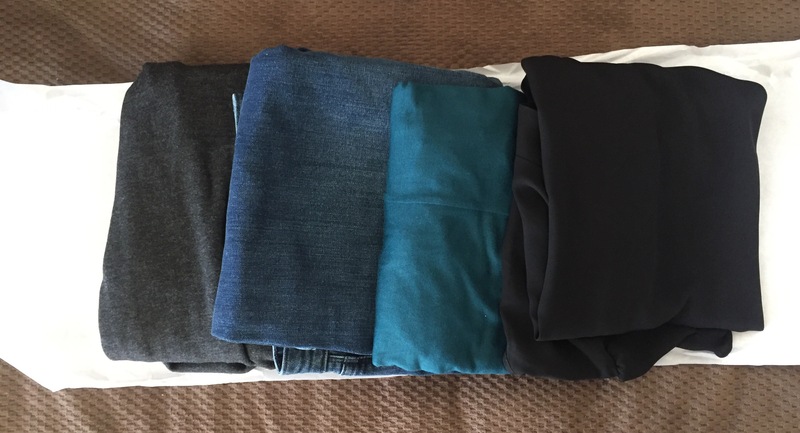 This was not a big surprise and I can’t really blame Stitch Fix or my stylist since my size was not actually listed in the choices for pants. 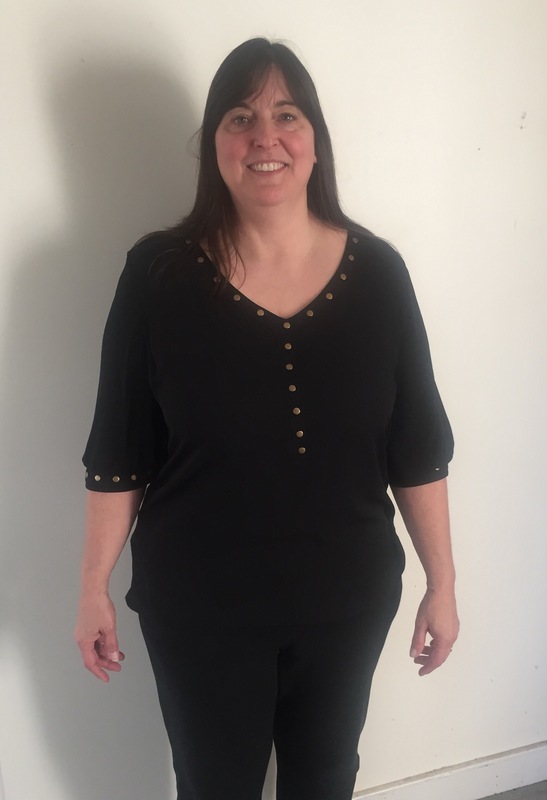 Happily, I have learned that Stitch Fix will be offering plus size clothing next month and I’m hoping to get a pair of jeans that fit in my next box. Even if they had fit I wouldn’t have kept these. I’m not into the “worn” look. I guess I’m showing my age here, but I can wear them out myself. Next was this black top. I liked the studded design. It was simple, fun, and different from anything I already own. I also liked the sleeves which, although you can’t tell from this photo, were cut at an angle and shorter in the back than the front. Unfortunately, it was just a little bit too tight, a little bit too short for my taste, and the sleeve sat directly in my elbow which was annoying. Two inches longer or shorter would’ve solved that problem. This teal, dolman top in a jersey was super comfortable. Unfortunately, it was also very clingy and emphasized everything I normally try to hide. I was happy to get a necklace in my box because I rarely shop for accessories. This Terry Blazer was also very comfortable. Unfortunately it, too, was at least one size too small. 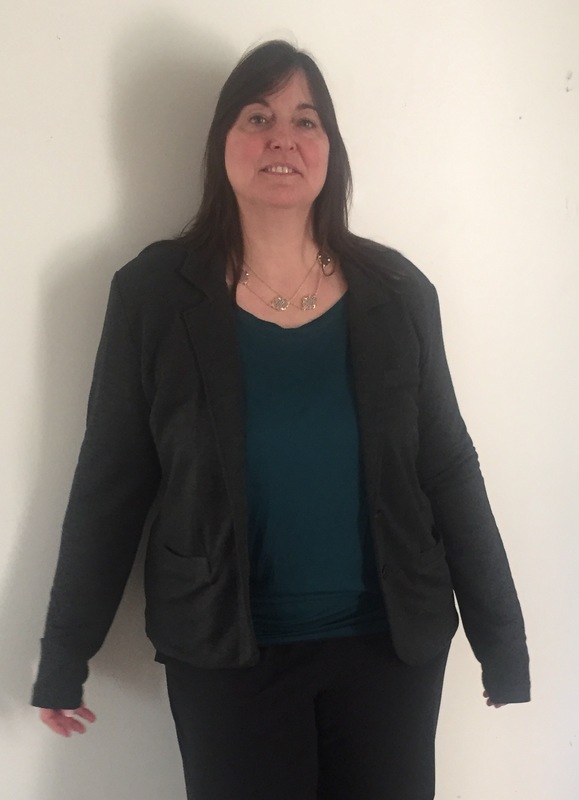 It had a breast pocket (which I don’t care for), the sleeves were a bit long and the jacket a bit short for my taste. It also had shoulder pads – ugh. Still, it was so comfortable that I would’ve overlooked all of that if it had simply fit me. Overall, I was pleasantly surprised. I know that sounds weird since I didn’t keep anything but, if everything had fit me, I would’ve kept the entire box. And, if I’d found these items at a consignment shop for under $10 each, I’d have bought them – even if they didn’t fit well. That’s how I ended up with a closet full of so-so clothes. The high-end prices will keep me honest and hopefully I’ll buy good, well-fitting clothes. I scheduled another box for next month and fixed my Pinterest link. I’d like to get on an every-3-months schedule so I can add new items to my wardrobe each season without having to run around the stores, so I’m keeping my fingers crossed for my next box. I’ll give an update when I get it. *Note – my hair looks awful in all of these pictures but you have to return within 3 business days and I didn’t have time to fuss before packing everything back up. In many ways it runs along the gender gap: Men hate it, women love it. Well, most women. I hate shopping. With a passion. (Except for small gift shops and yarn shops but that is more like visiting a friend’s house than shopping, for me.) My husband does the grocery shopping – that’s how much I hate it. And I love food! But shopping for it makes me crazy. Did I mention I love food? Love it. And it shows. It’s a constant battle to eat what I love without ballooning into a full grown whale. Which makes clothes shopping the worst. Shopping (yuck) for things that make me confront the results of last night’s chocolate binge (double yuck). Nope. Not if I can help it. But I like to leave the house once in a while, and I have a job, so clothing – beyond sweatpants & t-shirts – is a necessity. We’ve tried some other online subscription services with various levels of success. Naturebox: Monthly snack box. This is currently the only active subscription we have. I like getting healthy snacks without going into a store. Simple. BlueApron: Tried it. Loved it. Great food, easy instructions. Cancelled it because…well, I like cooking almost as much as I like shopping. Even just cooking 3 nights a week was depressing me because there was so much prep work. I know there are many people who do this on a regular basis, but… it wasn’t working for me. Give me a tuna sandwich and a bowl of soup or, better yet, a night at a restaurant. And Subway counts as a restaurant in my book. BarkBox: Our Bugg, Boo, got a bark box from our son years ago and the blue rubber bone is still her favorite toy. She’s still chewing on it 3 years later. But she really doesn’t need a monthly subscription. I order a box for her about once/yr. YarnBox: By FAR my favorite subscription EVER but I cancelled it because I now have more yarn in the house than I can knit in the next 5 years. When I reduce my stash I may be tempted to start again. So I signed up for it. I’ve spent at least 2 hours updating my Pinterest page with clothing I like — adding very specific notes. 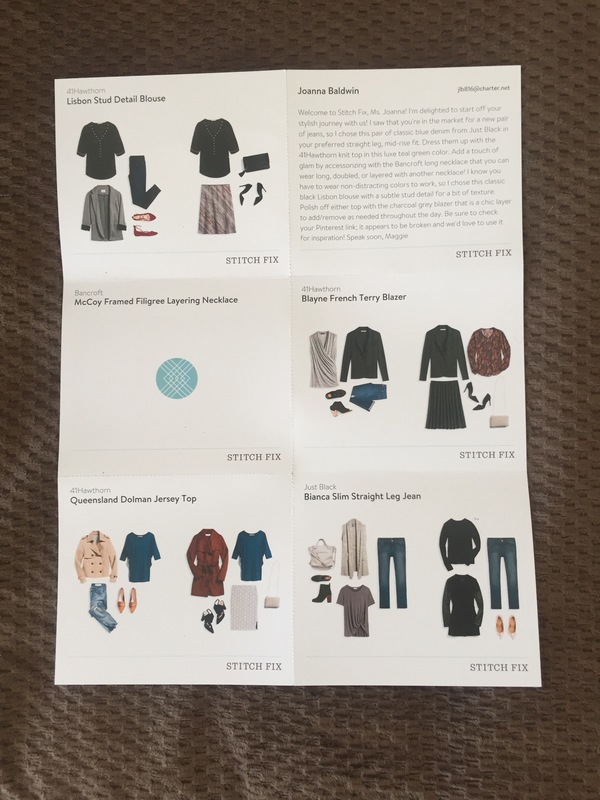 I’ve read about other people’s experiences with Stitch Fix and saw that if you keep everything in the box, you get a discount, so I’m hoping to give my stylist as much info as possible to make that happen. (You also get a discount if someone refers you, so if you plan to try it out, my referral link is at the bottom of the page – thanks!) I’m only signed up for a box every 3 months, hoping that the new pieces will get me through the season changes. Fingers Crossed. My first box is supposed to arrive next week. I will post the whole experience here: the good, the bad and the hopefully-not-too-ugly. I love this photo of Munchie. Munchie (officially, Munchkin – because he was as small as a doughnut hole when I got him) is the only cat I’ve ever gotten as a kitten. The Corner Bookstore, which at one time was actually located at the corner of two streets, but by this time was in the Stop & Shop center and not exactly on a corner anymore, had a lady working there who would bring shelter cats in and keep their cages by cash register. It was brilliant, really. I mean, cats and books just go together. My mom was at the bookstore and, knowing I had a “thing” for orange cats, called to tell me there was a kitten there I should see. I didn’t have to take him home, she said. I could just look. Right. I don’t know exactly how old he was, but he was small enough to fit in my coat pocket and that’s how I carried him home. He was adorable. Munchie was very nearly the perfect cat. He loved Lance, my dog. He got along with the other cats. He ate bugs. He rarely got sick. He was quiet and sweet, and I can’t remember him ever scratching or biting me. Ever. When I lived in Winsted, he was allowed to go outside. He loved that. I’d give a long, high-pitched call of “Mun-cheee-eee!” and he’d come running, tail high and straight. Most cats will rub along your leg to let you know they love you. Munch would come alongside your leg and not actually touch until… thump! his backside would bump you. Munchie was my bathtub cat. He’d drink the hot water out of my tub while the water ran. (He loved to drink running water from the bathroom sink, too – a penchant he taught to his “brother,” Morgan.) While I took my bath and read a book, Munch would walk around the edge of the tub til he found a ‘spot’ and would stretch out, so I could pet him while I read. 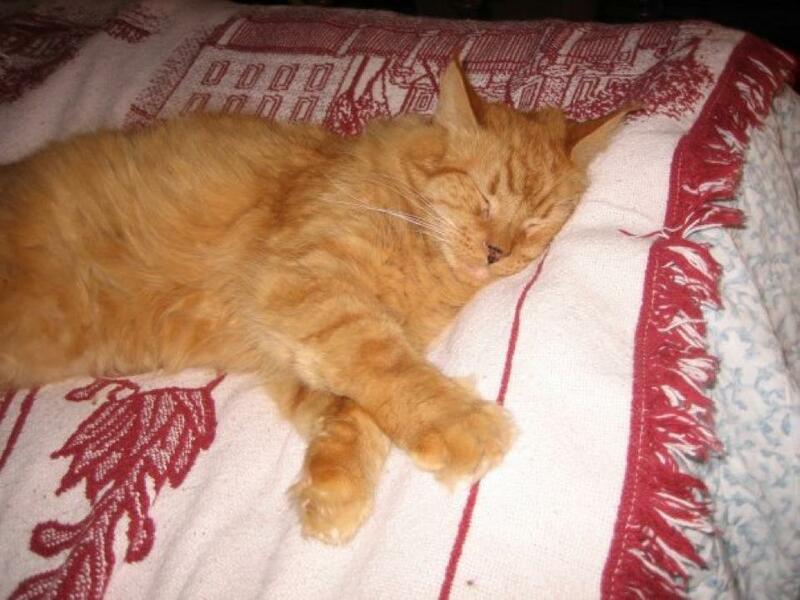 He came to me as a kitten and died of old age. A pretty perfect life for a pretty perfect feline. I have a memory of being a child, running outside ahead of my grandfather into the white wilderness in unadulterated joy. He was grumbling. As I threw handfuls of frozen splendor into the air, I shouted, “I love snow!” He answered, “That’s because you don’t have to shovel it.” I remember thinking he must be really old to hate snow. I don’t know why I decided that age played a factor in it, but it must. Even now my assumption is borne out in our vocabulary: pure joy is “unadulterated.” I am now an adult. I have become adult-erated. I no longer find joy in snow. Some of this is my own fault. I don’t participate in any winter sports, like skiing. I don’t particularly enjoy being cold. I also drive, a lot, for work and I don’t like driving in bad weather. Or on icy roads. I don’t care to have my family out there driving either. 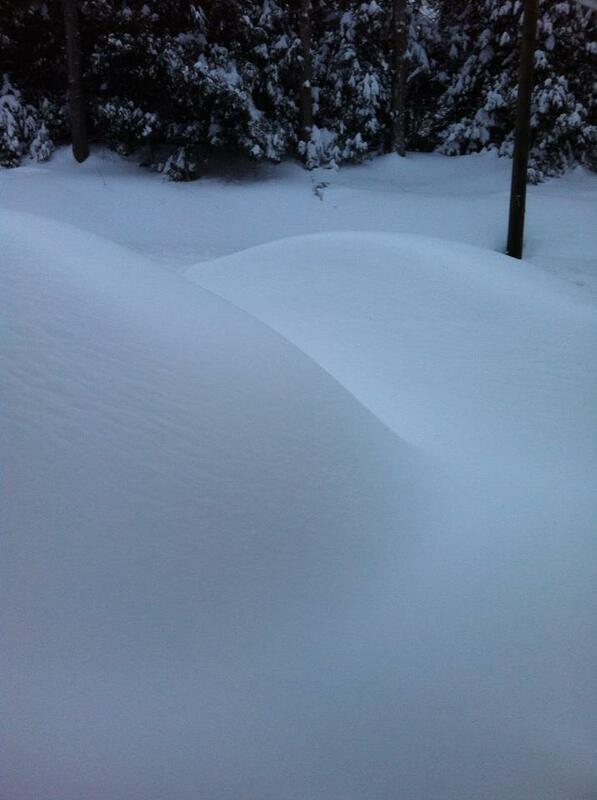 Our two cars under a blanket of snow. On the other hand, I love to knit and a lack of cold weather would severely limit my knitting options. How many scarves do you need if you never see snow? I would also hate to seemy pile of hand-knit socks go to waste. We have a nice wood-stove for the winter and I enjoy reading by the fire, although I haven’t actually done that in years. Again, that’s my own fault. One thing hasn’t changed, though. I love a good “snow day.” When the weather reports are accurate and the blizzard is here, there isn’t much you can do but wait it out. Schools are closed. Events get cancelled. Everyone slows down and waits out the weather. You need this rest because once the storm is over, the work begins; digging out isn’t easy. But for a moment, it is quiet and peaceful. One storm per year is plenty, though, and I’m thankful that February is a short month. Leia is one of the three cats that lived with Wes when he and I got married. She, Luke & UB were litter-mates. She was a bit neurotic and wary of strangers, which was anyone she decided was “strange” at the moment. I knew I had “made it” into the family the first time I came to visit and she sought me out. 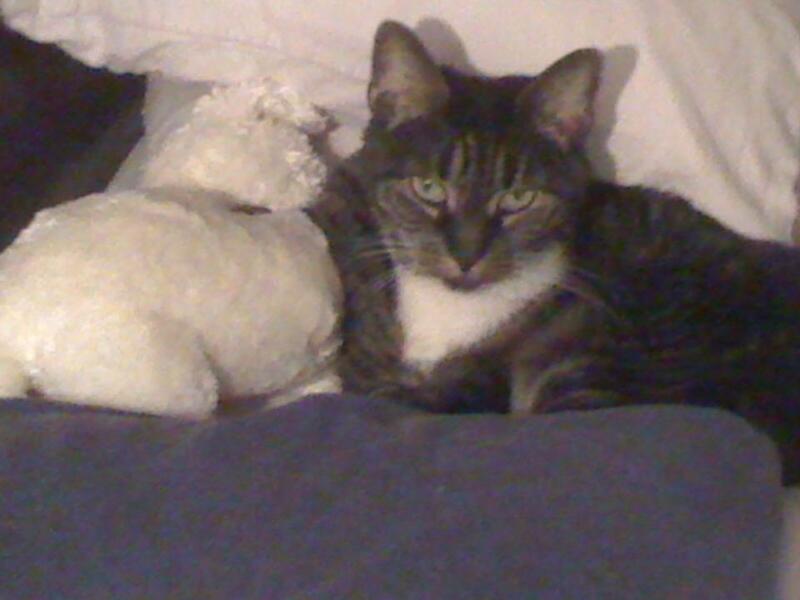 She is the most recent of our pets to leave us. Making the decision to put her to sleep was agonizing. She was very old, very sick and it was the right decision. None of that made it any easier, as anyone who has been in that position will attest. Losing Leia made me realize that I remembered more about the passing of my pets than about the lives they spent with me, probably because that moment is so heart-wrenching that it has burned itself into my memory. I decided that, before any more time has a chance to make my memories fade, I would jot down the wonderful things I remember about the wonderful animals who’ve shared their lives with me. 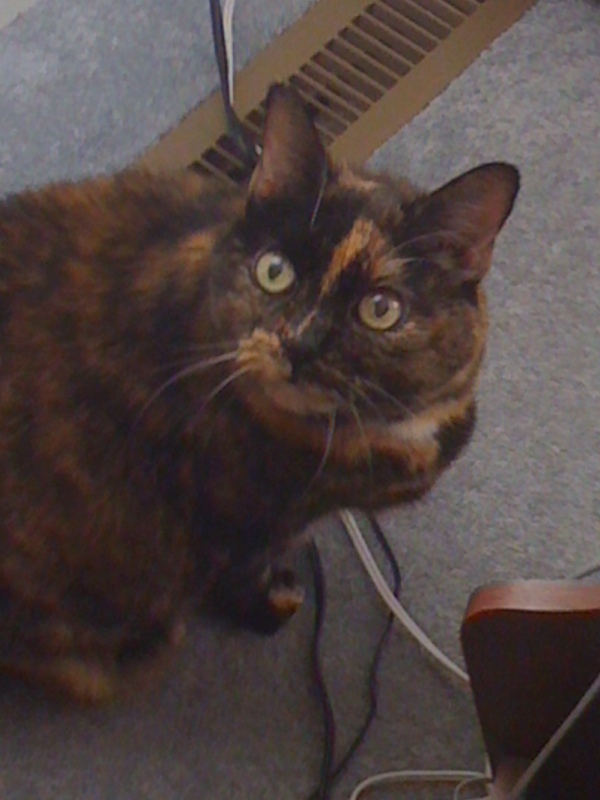 As for my Leia-lou, as we called her, she was a bit loony. Wes called her “Loopy-Lou.” He remembers that, as a kitten, she used to fetch bottle caps. She and her brother and sister would sleep together in a small basket. A few years ago Leia suffered from a condition called Mega-colon. We tried medication to see if we could alleviate the problem (it didn’t work). While she was on the medication we went to Cape Cod for the weekend and decided to bring her with us, since we didn’t want to make anyone else responsible for pilling her twice a day (not easy!). She cried the entire way to the Cape and then, once she realized she had us all to herself, she was in Heaven! After 3 days, we loaded her back into the car and she cried all the way home. 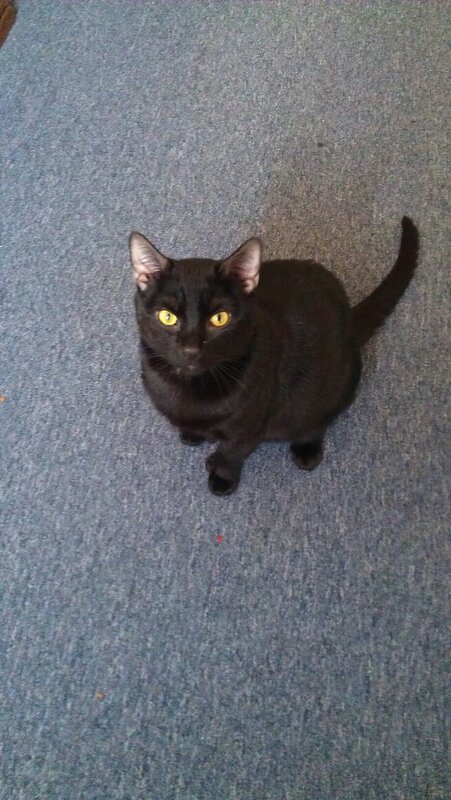 When we got back to our house, she looked at the other cats and was outraged! Apparently, we’d betrayed her. She thought we’d finally made her the sole heir to the feline throne. Poor Leia! She ended up needing surgery to correct the condition and, luckily, at the time,we were able to afford it. She came through surgery with flying colors. Leia was afraid of feet. Her eyes would dart around the room, watching the feet of the people approaching her. If you said her name as you got close, she would realize you knew she was there and wouldn’t step on her, and she’d relax a bit. When she was content, especially while being petted, she’d purr until she drooled. (This is a lot more endearing than it may sound.) And, although she was still wary, I got her to let me carry her around like a baby, upside down in my arms. I will miss her terribly. I expected to write one post and include all my pets in it. What was I thinking? Obviously, one post is not enough space to fit them all. More memories to come.